Easy to follow. Can’t wait to try it. I love that you’re teaching your little girls a new craft! Amazing! Easy to follow! Well worth the price! I am a beginner and this was a perfect starter project. New Wall Hanging available now! 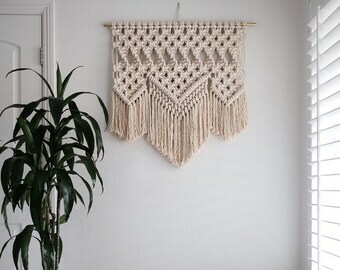 New DIY Macrame Pattern available now. Prepping for a photo shoot. DIY Pattern available in my shop. Finished installation in a Los Angeles showroom. I create thoughtful and quality custom work for beautiful interiors. Through my Etsy shop, Reform Fibers, I offer Do-it-Yourself Macrame Patterns and Kits to help creatives who want to keep their hands and mind busy, strong, and healthy. I am a Fiber Artist with an emphasis on Macrame. I have 20 years experience with Knitting and Crochet and have dabbled in Punch Needle, Embroidery, and Weaving. In the summer of 2015 I learned to Macrame and I haven’t been able to put the rope down since. I have found working with my hands to be therapeutic and find it fulfilling to share my knowledge with others. I have worked with West Elm, Autograph Hotels, Poketo, Etsy, Modernica and Intelligentsia. I am based in Chino Hills, CA and teach at Workshops, Team Building Events and House Parties. My husband, Bobby, and I have two little girls, Vivienne and Katherine. If you would like to collaborate, or just have a question, please contact me. I am Elsie Goodwin and I am the working hands behind Reform Fibers. I am a fiber artist, wife and mother of two girls. I have a background in the fashion industry, where I spent 15 years working as a buyer in Southern California. Can I sell the items that I make from your patterns? I'm sorry, items made from my patterns, or the patterns themselves, cannot be sold or auctioned. I work hard to differentiate myself in a competitive market and encourage you to create your own unique designs to sell. All of my patterns are copyrighted and are intended for personal home use only. Finished pieces are OK to gift, but never ok to sell. Thanks for your support and honesty and for supporting what I do for the creative community. I like one of your patterns and would love to purchase the piece already made, can you make one for me? Definitely, just message me and I can send you pricing. Where do you purchase your rope? What supplies do you suggest for a beginner? I am a complete beginner, do you think that I will be able to read your patterns and complete a project? How do I measure out rope for my project? I don’t know how much rope I need, but I want to make a really big piece for my window/wedding/home/friend. I always advise to work with patterns to familiarize yourself, see what you like about them. How much rope did you need, did you like the size of the rope, could they have been longer, shorter etc. There is no one "fool proof" answer, not one calculation that works every time. The variables that go into deciding on rope length are the size of the rope you're using, the Knot combination you're using and your tension. Every knot takes up a different amount of rope, every size (diameter) of rope will change your outcome and everyone's tension is different. Another option, if working on a piece that will take 48 pieces of rope, cut 8 of them, work your idea of knots & see what overall length that will give you, then dive in and cut the rest.